Probably you just want to take to the hill when you see them coming towards you. Yeah, i had the same kind of views towards Kenyan Police until i met Mr.Gitahi Kanyeki during Social Media Celebration at Norfolk Hotel. The man who admitted that he had taken bribes before but he is now reformed. Then he posed the question “You have given bribes, have you reformed?” Mmmmh have you? 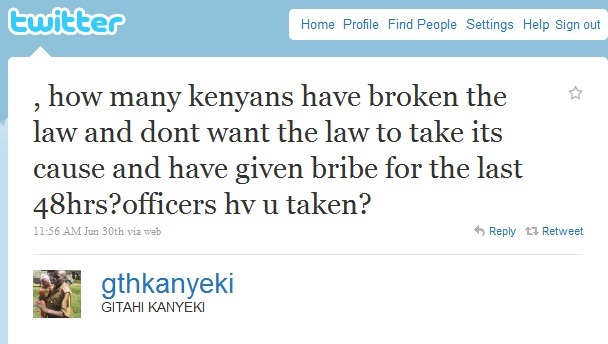 Believe me Mr. Kanyeki is a social media addict. He Facebook and tweet on the move. Here is Mr.Kanyeki’s facebook page with over 1381 friends as of the time of writing this article http://www.facebook.com/gthkanyeki . His Twitter handle is @gthkanyeki. I say #FollowEveryday. 30th of June was Kanyeki’s first day to step on Norfolk Hotel. A place he described as only for The Police Commissioner and the highest of highest in Police Force ranking order. How about you tweet and share this on Facebook if you feel like me that Kanyeki should go back to Norfolk for a proper meal courtesy of Norfolk…..
People see us in a very negative way. 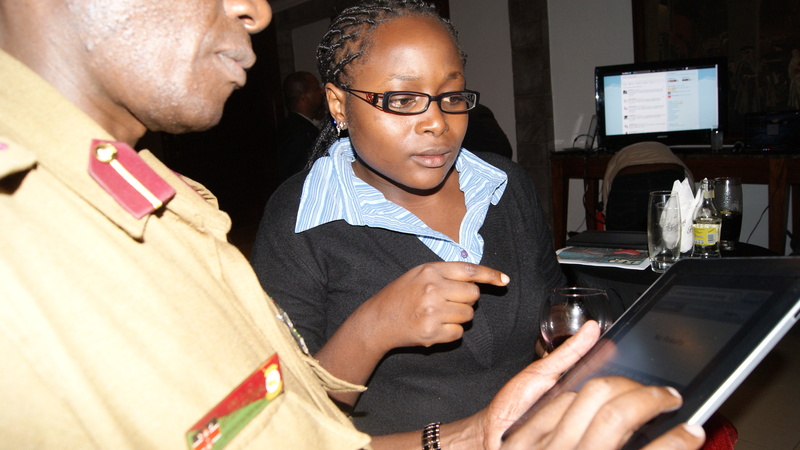 Thus in this kind of forums [Social Media Day Kenya 2011] nobody would think of inviting the nearest police officer in charge. All of this has resulted in people forming opinions of us. We are arrogant, unapproachable and uninterested [making some of us the most unpopular ones]. In turn, we have formed opinions that the public don’t like us and that we are unappreciated and not understood. It’s a vicious circle. We cannot control what opinions people form, but we can try to influence the reasons why they think about them. Yes we are told we are corrupt in the manner of receiving bribes. We have had to be the winners of the most corrupt institution in our country in a competition discipline without a trophy. This brings out the question of who gets the number one position of giving bribe. This is a challenge to all of us as Kenyans. If only we had more opportunities like this I think all of us would benefit from it. 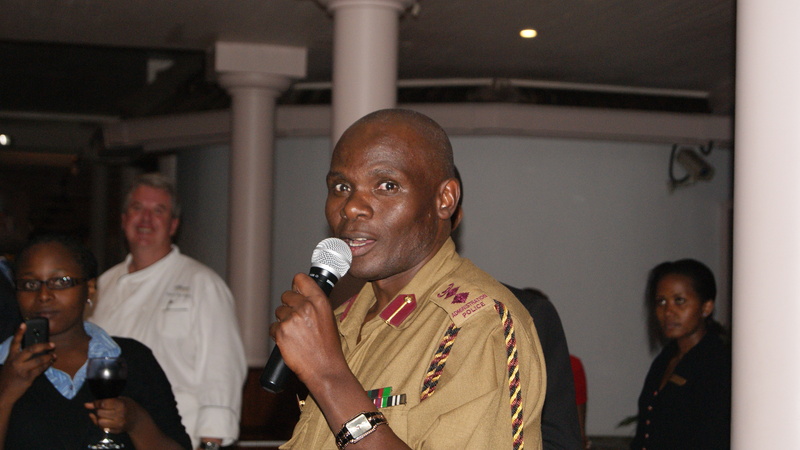 “The fact is that, we as Kenyans are in the process of constructing a national police service. The constitution under article 243 establishes the national police service. Section 2 subsection (a) and (b) of the same article establishes the “the two services-Kenya police and Administration police respectively. The functions of the national police are laid out in article 244 of the constitution. For the purpose of this function I would quote section (e) of article 244 (foster and promote relationship with the broader society). As one way of adhering to this function we as police officers have to create a room for the Kenyans to change their perception towards the police. It is our role to go out there and tell the public who we are. This is where the social media comes in as a tool to communicate. Personally I have a social media (fb) communication site on issues of fighting corruption in the police and assisting the needy in the society. Here we are able to interact with mostly the young people of this country. At the same time it’s an opportunity to interact with mostly young police officers and fight this animal called corruption hear. Kenya has great vision – Kenya Vision 2030. The aim of this vision is to make Kenya a newly industrialized, middle income country providing high quality life for its citizens by the year 2030. ECONOMIC PILLAR: Aims at providing Kenyans with prosperity through an economic development program me aimed at achieving an average GDP growth rate of 10% per annum up to 2030. SOCIAL PILLAR: Seeks to build “a just and cohesive society with social equity in a clean and secure environment”. POLITICAL PILLAR: Aims at realizing a democratic political system founded on issue-based politics that respects rule of law and protection of human rights. The Administration Police plays a critical role in supporting the implementation of Kenya Vision 2030. ECONOMIC- The AP will strive to provide a peaceful and secure environment conducive for conducting business 24 hrs a day as outlined in the force’s mission and vision statements. SOCIAL- As outlined in its current strategic plan, Administration Police, will mainstream Human Rights and gender issues in the day to day operations of the force. POLITICAL- The Administration police will always, during the implementation of vision 2030, be result oriented and accountable to the public. The department will enhance the rule of law as stated in the political guiding principles of vision 2030. Security, peace building and conflict. Management which are key factors in the vision’s Political pillar are already deliverables in the department’s current five year strategic plan. Businesses and organizations of all type have been quickly joined in to the benefits of using social media to enhance their presence in the marketplace and help define their service or product, and now these calls for law enforcement join the ranks of the social-media to show the other side of their coin. It is no secret that law enforcement organizations often suffer from image issues, and justice professionals maintain that a large part of the problem is poor communication with the public. we cannot run away as social media is here to stay for those who are ready to use it in positive way. we cannot be left behind as police officers as we wave a big burden of building our image. The only answer to this is the social media. Biometric Registration Process to cut out public servants.